The Faculty Artist Series continues with D. Ray McClellan on Oct. 11 at 7:30 p.m. in Ramsey Concert Hall. Editor’s note: Unfortunately, due to unforeseen circumstances, D. Ray McClellan’s Oct. 11 Faculty Artist Series concert is now cancelled. Refunds will be given to anyone who has already purchased tickets. 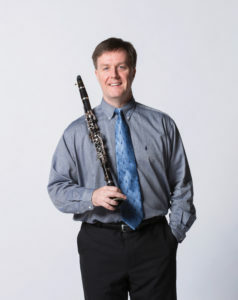 Join D. Ray McClellan, Hugh Hodgson School of Music professor of clarinet, as he brings clarinet and strings music, along with friends and family, to the Ramsey Concert Hall stage Oct. 11 at 7:30 p.m. for the next Faculty Artist Series concert. The evening opens with an aria by J.S. Bach arranged for clarinet, violin, cello and piano, titled Bete aber auch dabei, which translates as “But you should also pray” from Cantata, BWV 115. The other two pieces, both by British composers, are for clarinet and string quartet. “The two British works are delightful, playful and beautiful, and of course, the J.S. Bach is sublime,” McClellan said. One of the latter pieces is by Charles Villiers Stanford and the other by Samuel Coleridge-Taylor. In 1887, The Times in London said that Stanford’s music is “dramatically significant, as well as beautiful in itself” because it had “style.” Coleridge-Taylor, another celebrated British composer, collaborated with the composer Edward Elgar and sought to draw from African American folk music and work them into beautifully full-scale classical works. It is significant to note, for this “concert of connections,” that Villiers Stanford conducted a premier of one of Coleridge-Taylor’s works and each of these composers wrote music for the church. Adding to the program will be several other musicians, including several family members, as well as friends who aren’t strangers to campus. Performers will include husband-and-wife team Michael Heald, violin; Maggie Snyder, viola; and cellist Andrew Reynish. McClellan’s wife Erica McClellan will play piano, and their daughter Rachel McClellan will make her Performing Arts Center debut on the violin during the opening Bach piece. Violinist Rachael Fischer, assistant professor of violin at Georgia Gwinnett College, is a UGA graduate and former student of Heald. Tickets for the concert are $12 for adults; $6 for students and children. All proceeds directly support student scholarships at the Hugh Hodgson School of Music. The concert also can be streamed live on the music school website at music.uga.edu/live-streaming.